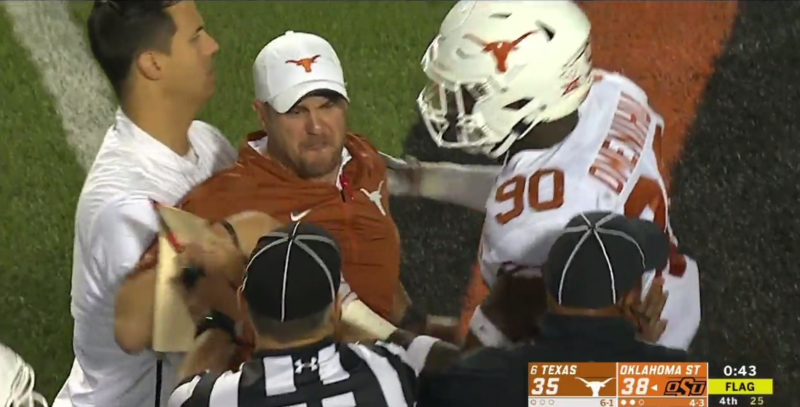 Texas coach Tom Herman was visibly upset Saturday night in the waning moments of OSU’s 38-35 upset over his sixth-ranked Longhorns, storming the field to show Mike Gundy that, apparently, he’s a man and he’s 43! The incident took place with less than a minute in the fourth quarter after OSU had just snapped the penultimate snap of the game. Things got chippy on the field after a frustrated Texas player played past the whistle and initiated contact, leading both teams to bow up a bit. Gundy reacted by going onto the field, quite clearly to get his team away from the imminent dust-up. Herman didn’t take kindly to it and appeared to mouth something along the lines of … well, I’m not exactly sure what he said here.